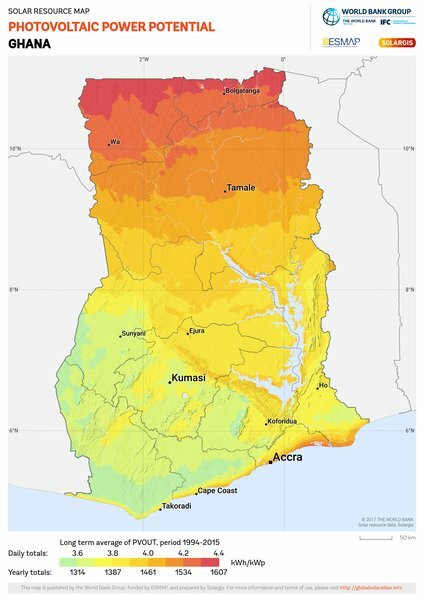 The solar power potential in Ghana is enormous. This is due to the location of Ghana near the equator and the potential increase in electricity consumers in rural areas who now lack a steady electricity supply. Thus far, the main renewable energy source in Ghana is from water. Since the potential power generated from the sun is so huge, the Ghanaian government has set goals to bring this potential about. m² per day. Every year, there is an average of 1800 to 3000 sun hours. 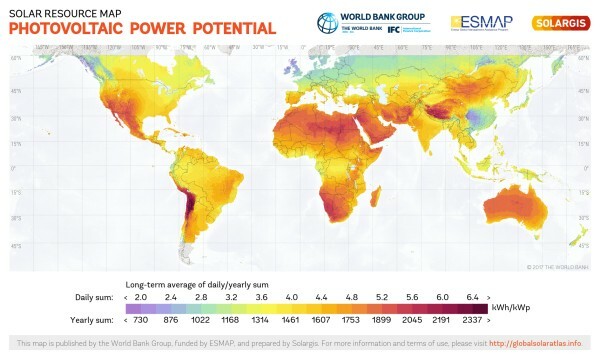 Especially compared to other countries in the world, Ghana has a high solar potential. It might not be the highest in the world, but it is comparable to for example the south of Europe. As becomes clear from the image 2, the north has the highest irradiation levels on a yearly basis. For an overview of city-specific averages of solar radiation, take a look at the table below. The access to electricity in Ghana increased immensely over the past decades. In 1990 only 15 to 20 percent had access to electricity. In 2016, 82.5 percent of the Ghanaian population had electricity access. This percentages is expected to grow to a 100 between 2020 and 2025. Unfortunately, this access has not been a steady one for a while, due to several electricity crises also known as Dumsor. Also, having access to electricity is not the same as having a house connected to the grid. This means Ghana is in need of a reliable solution. More on the solar sector in Ghana?